Flip Shopping Catalog is helping to build digital shopping catalogs with realistic page-flipping effect. It provides a new and interesting way to promote and sell products online. The Flip Shopping Catalog program is easy-to-use and will help to build a shopping book within minutes, and output to multiple formats for people to shop online on different devices such as PC, Mac, iPhone, iPad and Android devices. Use the shopping catalog creator to make your E-commerce more attractive and effective now! • Convert PDF to Adobe© Flash® based digital shopping catalogs with page-flipping effect. • Batch convert multiple PDF files to a single or multiple page-flipping eBooks with template settings. • Provide command line version. • Free use service version to watch folders and create flipbook automatically. • Import bookmarks (outline) with PDF, and edit them manually. • Import hyperlinks with PDF, include web link, page link, email link. • Import text so text is searchable, define the minimum search characters. • Detect landscape page to present as two-page spread. • Add watermarks text, image, dynamic date/ time etc to page-flipping eBooks. • Define quality and size for normal version and mobile version. • Publish online directly with using FlipBuilder Upload Service. • Build digital bookcase to store and manage eBooks. • Output in different formats: HTML, EXE, Zip, Mac App, Mobile version and Burn to CD. -- HTML allows you to upload to a website to be viewed online (with title, keywords and other metadata defined). -- EXE (with setting title, icon and open window size) and Zip allow you to send to your user by email to be viewed on their computer. -- App (Mac Application) is executable application can be run on Mac. -- Mobile version is to output HTML flipbook which can be viewed on mobile devices via Browsers. -- Burn to CD allows you to burn to disk so you can send your user physical media for viewing on their computer. • Publish flip book to your FTP server directly. • Create *.scr format flip book to use as Screen Saver. • Publish flip book and Email to an address directly by choosing "Email to" output type. • Download different templates online . • Apply a pre-designed template. • Preview book output effect in Flash (on PC), HTML5(on iPad), Mobile(on iPhone and Android phone) and Basic HTML (SEO Version). • Add HTML Title in Float template which can be clicked to visit webpage online. • Add Image or Flash logo to insert before Book Title in Float template. • Define book proportions, margin size, shadow manually. • Replace existing icons on toolbar by editing Icon Flash file. • Add new icons into toolbar with calling new actions. • Set background color and image. • Insert background music either for continuous play (loop) or for a set duration. • Set eBook reading from right to left (for Right-to-Left languages such as Arabic). • Choose hard cover for eBooks. • Set fonts for Flash and Bookmark panel. • Set Page Number Box to show at top or bottom in Float, set start page number. • Select flash pre-loader for your flip book. • Edit pages with links, images, videos, flash or sound files. • Define the language for your published page-flipping eBook (support multi-language show and switchable). • Add password to protect your page-flipping eBook. • Set render engine for conversions: SWF, GPL Ghostscript or Inner Library. • Add Google Analytics Support. • Add watermark image or SWF to show on print out pages. • Add Help config to manually define content with using Image or SWF. • Add Single/Double Page view. • Add Minime Style to show page-flipping eBooks without toolbar. • Set permissions for downloading, printing, social sharing, Home, About button and more. • Edit bookmark manually and set bookmark panel to show on left or right side. • Export and save settings for future uses. • Save and Load your project. • Build your digital library to store and manage ebooks publised on FlipBuilder Server. • Drag the corner to flip a page. • Click page shadows to flip a page. • Use mouse wheel to flip pages. • Input password to unlock encrypted pages. • View with important pages pre-loaded to open quickly, no need to wait for all pages to be loaded. • Use Previous, Next, First or Last buttons to navigate through the pages. • View page-flipping eBook full screen. • Use page thumbnails to navigate. • Print out the whole eBook or a selected range of pages. • Download the uploaded page-flipping eBook direct from the web site. • Double-click to zoom in or zoom out. • Zoom in/ out both pages. • Manually control zoom in scale in Float template. • Share eBook url via email, Facebook, Twitter, Google, Yahoo, etc. • Turn page-turning sound on/off. • Open in the Browser to a specific page by adding a page index to your URL. • Always show in Minime Style with adding a parameter to URL. • View page-flipping eBooks on Mac, iPad, iPhone and Android devices. 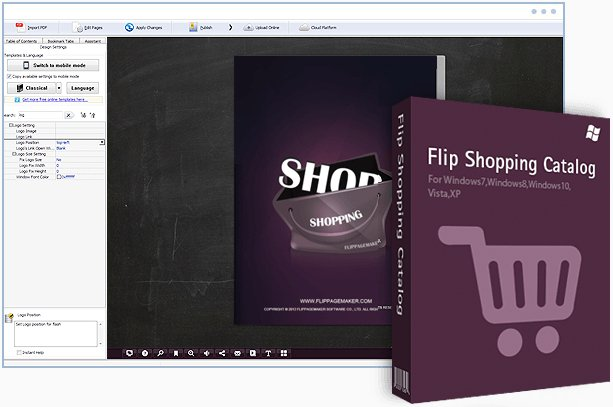 free download Flip Shopping Catalog v2.4.9.23 Multilingual.Flip Shopping Catalog v2.4.9.23 Multilingual full from nitroflare rapidgator uploaded turbobit extabit ryushare openload littlebyte zippyshare.